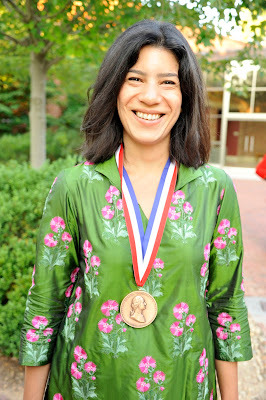 Prize winning author and historian Maya Jasanoff. Click here to listen to Tom Hall's interview with Maya Jasanoff for the WYPR show Maryland Morning. CHESTERTOWN, MD— History, they say, is usually told by the winners. But the winner of the 2012 George Washington Book Prize, author Maya Jasanoff, has uncovered the compelling and often moving stories of men and women who found themselves on the losing side of the American Revolution. Jasanoff will share stories and insights from her book Liberty's Exiles: American Loyalists in the Revolutionary World at this year’s George Washington Book Prize Celebration at Washington College, on Thursday, November 8 and Friday, November 9. All events – which are hosted by the College’s C.V. Starr Center for the Study of the American Experience – are free and open to the public. 9:30 a.m. - “Authors in the Egg: How Books Are Born.” Washington College students, faculty, and members of the public are invited to an informal conversation with Maya Jasanoff. A light breakfast will be served. Jasanoff received the $50,000 prize at a black-tie dinner at George Washington’s Mount Vernon Estate Museum and Gardens last June. Sponsored by Washington College, the Gilder Lehrman Institute of American History, and George Washington's Mount Vernon, the Washington Book Prize is one of the largest literary prizes in the nation. Given annually for the year’s best book about America’s founding era, it particularly recognizes well-written books that speak to general audiences and contribute to a broad public understanding of the American past. In addition to the 2012 Washington Book Prize, Liberty’s Exiles also received the 2012 National Book Critics Circle Award for General Nonfiction and was shortlisted for the BBC Samuel Johnson Prize in Nonfiction. “At the heart of this smart, deeply researched and elegantly written history is Jasanoff’s re-creation of the lives of those who emigrated — rich and poor, white, black and in some cases red,” wrote New York Times reviewer Thomas Bender. Jasanoff, a Professor of History at Harvard University, was awarded the 2005 Duff Cooper Prize for her first book, Edge of Empire: Lives, Culture, and Conquest in the East, 1750-1850, which was a book-of-the-year selection in numerous publications, including The Economist, The Observer and The Sunday Times. She has contributed essays to The New York Review of Books, The New Republic, The Guardian, The New York Times Magazine and other publications. Created in 2005 to honor the year’s best book about America’s founding era, the George Washington Book Prize was presented that year to Ron Chernow for Alexander Hamilton. Subsequent winners have included Stacy Schiff (2006), Annette Gordon-Reed (2009), Richard Beeman (2010), and Pauline Maier (2011). Washington College’s Starr Center administers the Book Prize, which is co-sponsored with the Gilder Lehrman Institute of American History and George Washington’s Mount Vernon Estate & Gardens. Washington College was founded in 1782, the first institution of higher learning established in the new republic. George Washington was not only a principal donor to the college, but also a member of its original governing board. He received an honorary degree from the college in June 1789, two months after assuming the presidency. The C.V. Starr Center for the Study of the American Experience, founded at the College in 2000, is an innovative center for the study of history, culture and politics, and fosters excellence in the art of written history through fellowships, prizes, and student programs. www.washcoll.edu. Founded in 1994, the Gilder Lehrman Institute of American History is a 501(c)(3) nonprofit organization supporting the study and love of American history through a wide range of programs and resources for students, teachers, scholars, and history enthusiasts throughout the nation. Gilder Lehrman creates and works closely with history-focused schools through its Affiliate School Program; organizes teacher seminars and development programs; produces print and digital publications and traveling exhibitions; hosts lectures by eminent historians; administers a History Teacher of the Year Award in every state and US territory; and offers national book prizes. The Gilder Lehrman website, www.gilderlehrman.org, serves as a gateway to American history online with rich resources for educators designed specifically for K–12 teachers and students.